Educational Technology / Classroom Technology: How Do You Like Your Learning, Flipped Or Blended? 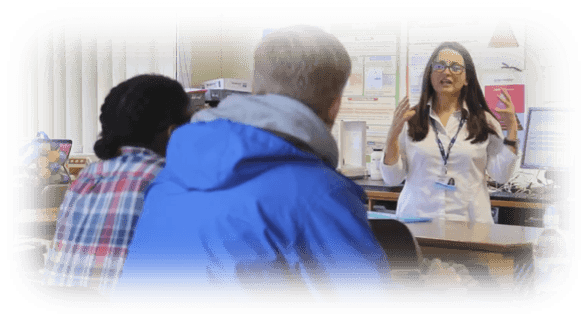 Classroom Technology: How Do You Like Your Learning, Flipped Or Blended? Masochistic teachers, fear of failure, and tried and trusted methods explain why many educators fail to embrace the classroom technology available to them. This article explains why if anything makes my life easier, then I’ll do it. 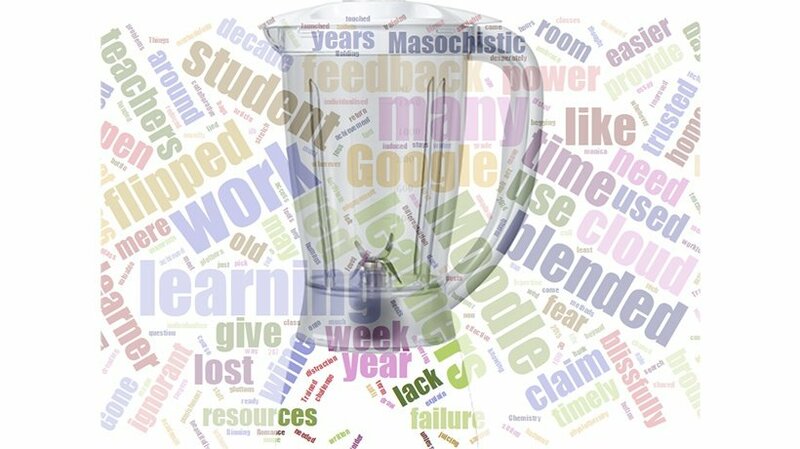 Blended learning like juicing is the flavor of this academic year. In 2015 your eLearning wasn't learning, unless it was flipped. Whatever term is used, the power of classroom technology to enhance learning, whilst recognized, is not being used by many educators (Vaughan, 2016). This year more than ever I have taken to the Cloud like a duck to water. It's not just the plethora of free resources that are out there begging to be used, or the fact that they may provide novelty for my 16-19 year old students as a distraction from the mundane, but the power of these tools to provide learners with the feedback they need to move on. Teachers as mere humans are not omnipresent, much as we'd like to be. The Cloud however is, on 24/7; it can facilitate learning at the point to individualize learners needs whenever and wherever. “Differentiation”, “stretch and challenge”, “individualized learning”, “collaborative learning”, “flipped”, or blended whatever monica Ofsted (Inspectors in England) and their ilk pick up on as the flavor of the month can of course all be achieved in the classroom and beyond utilizing traditional, non tech methodology. Many teachers are still blissfully ignorant of how classroom technology can return them valuable time, reduced workload, and improved learner outcomes. You may beg the question as to why this technological gap when access to Cloud based materials have been around for at least half a decade. Many teachers will respond that lack of time, training, and costs are to blame. The elephant in the room is fear of failure and having to meet quantitatively measured targets. Holding onto the tried and trusted, whilst knowing there must be a less punishing way, is the route many of us choose. Teachers are gluttons for punishment. Many of us need physiotherapy struggling home week after week with bags of marking. The mere stress induced sitting it out dreading the time to draw out the red pen ready to give timely and meaningful written feedback can call for a bottle of red wine. What happens when you spill that desperately needed glass of red wine over your grade A student’s beautifully constructed essay? Do you spend hours stressing over the thought that a student lied that they handed you the work or maybe you left it in the staff toilets? Google Drive for Education has solved many of these problems for me. Five years ago I wouldn't have touched it. In 2016 I couldn't be without. Binning the red pen I am able to give timely feedback from a bank of comments I have stored. Not only that I can feedback synchronously! That is at the same time the student is working on a report. My biggest savior came in 2014, when Google launched Google Classroom. Gone were the days when a student had shared work with me only for me having to use the search button to come up with 5 redrafted versions of the same work. Each classes' work stays in the same folder, named with the individual’s name never to be lost or have virtual red wine spilt over its hallowed contents. “Miss, it’s on the computer at home; or I've lost my pen drive!” are excuses of the 2010’s. Moodle has been bad mouthed by many a teacher mainly due to its perceived lack of intuity and untidy, unfriendly user interface. Students often complain that a teacher has told them “it's on Moodle” only to discover that looking for said work is akin to searching for a needle in a haystack. Moodle’s calendar has solved all of those issues for me. I can use Moodle as a repository to my heart’s content, but all my students need see at the front end is their work to be done outside the classroom that week. 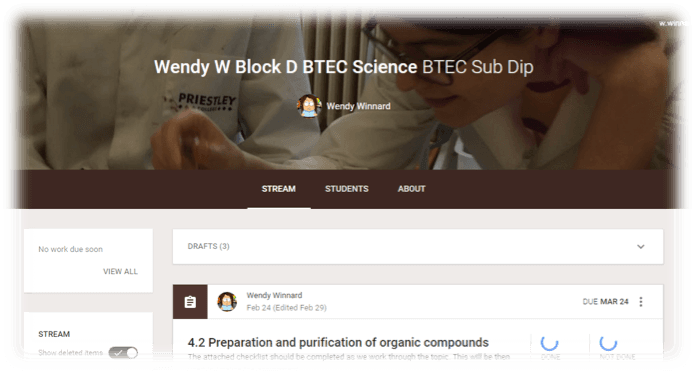 It is the perfect tool to deliver flipped learning, should you wish as YouTube videos can be embedded as can hyperlinks to any other cloud based application. I can set anything from old fashioned reading tasks and note making to completion of online objective tests. Get this; I can even claim that I am differentiating as each learner can work at their own pace utilizing resources which suit them. Gone are the days when a student can claim that he/ she was absent when the work was set, they lost their homework diary, or they didn't know the deadline. If your institution has PCs and laptops, that the student can work on in their free time and they cannot claim the digital divide excuse either. Moodle really is Big Brother, as you can monitor when your learners were accessing the work. Reluctant learners can be named and shamed should you wish to be ruthless as simply clicking on participants’ link will give you a list. Communication with learners has never been easier, but this feature of Moodle has been around for over a decade. 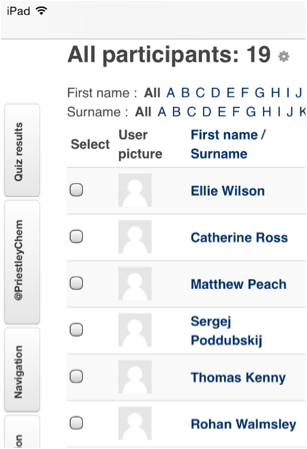 Selecting individual learners, you can contact them in a click to revive their intrinsic motivation. The advent of Open Badges makes the educator's life even easier however as collection savvy youths race to earn their hard earned evidence. Encouraging learners to complete online activities has never been easier. Having used technology for over fifteen years, inside and outside my classroom, the lines are blurred. In my humble opinion teachers were flipping learning well before the advent of YouTube and since the first overhead projector made its way into schools technology has played a part. So School Inspectors and techno phobic School leaders don't expect to look for "blended learning" in my students' diet. These digital natives, when questioned "does your teacher use blended methods?" should not recognise the difference. Let us celebrate those highly creative educators who can utilize the amazing plethora of technology on the cloud to realize a love of learning.